Today one of the BBC World Service's longest-running programmes celebrates its fiftieth anniversary. Outlook specialises in seeking out the human interest stories behind the news headlines. 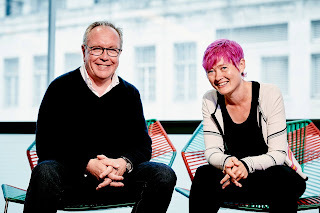 In today's live edition regular presenters Matthew Bannister and Jo Fidgen (pictured above) will celebrate "extraordinary people whose stories have inspired others around the world". Launching on 4 July 1966 Outlook was different from other news programmes on the World Service at that time. The brainchild of the then Head of Talks and Features, Douglas Muggeridge, it was "a news, current affairs and magazine programme, with reports and features from around the world and star guest to chat live in the studio". That first programme was presented by former BBC war correspondent Bob Reid who looked after the Monday and Tuesday editions until his death in 1971. On Wednesday Colin Hamilton was in charge, whilst John Tidmarsh took care of Thursdays and Fridays. In the early years Outlook was more news agenda-driven than it is now. The scheduling followed the pattern of two live 45-minute editions a day, one in the afternoon and one in the evening with a recorded 30-minute overnight edition added later. (Nowadays the single daily edition is usually recorded). The programme would typically start with two or three current news items and then a review of the press - initially with Sam Pollock then later with Conn Ryan, John Thompson and Nancy Wise. The remainder of the programme would be three or four features looking behind the news, often including an interview. Outlook took on special significance to those captured and held hostage in Beirut. "Terry Waite, chained to a radiator for the best part of five years, between 1986 and 1991, one day heard his cousin John Waite presenting an edition: when this was revealed (by John McCarthy on his release), it was the first evidence that Terry had access to the radio. Outlook responded by putting out a special edition with Terry's favourite music, Bach's Tocata and Fugue in D minor". John McCarthy would go on to join the Outlook team and present the midweek editions. Other regular presenters over the years have included Barbara Myers, Hugh Sykes, Mike Bullen, Heather Payton, Caroline Wyatt, Janet Trewin, Frank Partridge, Frederick Dove, Nicky Barranger, George Arney, Lucy Ash, Rajan Datar and the present team of Matthew Bannister, Jo Fidgen and recent recruit from LBC Petrie Hosken. (Barbara, Heather and Frederick were each with Outlook for just over 10 years, Matthew has presented for about eight years). Outlook has evolved over the years and is unrecognisable from its original format. It was threatened with the chop in 2005 as the World Service adopted "a clearer role as a news and information provider". But it survived and flourishes with its promise of going "around the globe through incredible personal stories". In this Outlook montage you'll hear John Tidmarsh, including an interview from 1999 with Frederick Dove, Colin Hamilton, Barbara Myers, Frederick Dove, Heather Payton, John Waite, Caroline Wyatt, Lucy Ash and Matthew Bannister. There are two theme tunes: the dramatic Hellraisers composed by Syd Dale that was used until the early 80s and then in the late 2000s an electronic tune I can't identify. 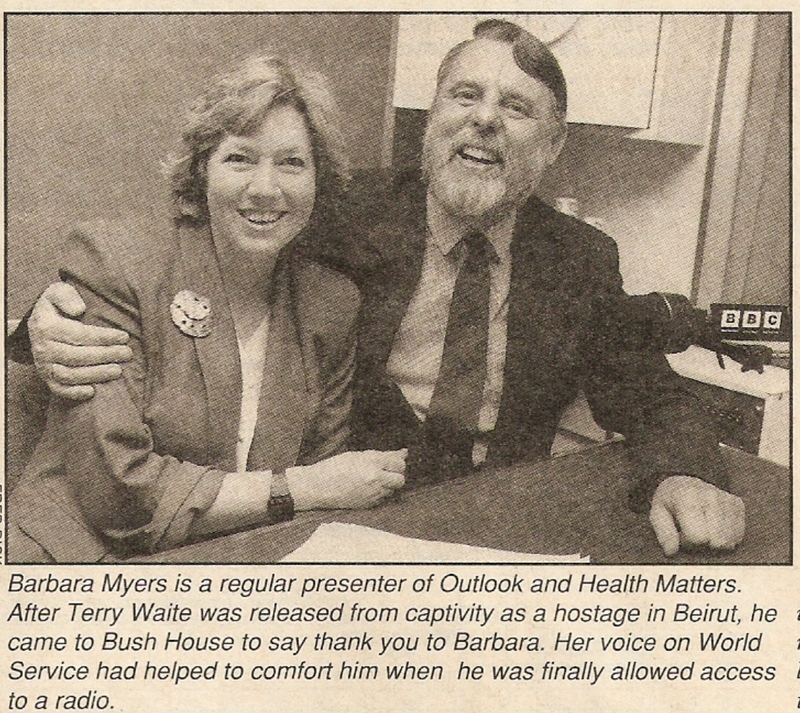 John Tidmarsh was Outlook's longest-serving presenter with a 32-year tenure. He brought a wealth of journalistic and presenting skills, as well as a sense of humour, to the programme. He was born and raised in Surrey but his Army captain father moved around a bit so the Tidmarsh family moved first to North Wales before settling near Bristol. That's how come John found himself as a cub reporter, aged just 16, at the Western Daily Press towards the end of the war. A year after hostilities ceased he joined the RAF for his National Service, getting his first opportunity to speak into a microphone as a radio operator on a Singapore posting. On demob he was back at the Press and following the fortunes of Bristol Rovers. When the local hospital radio organised commentaries for the home games, John put his name forward and bagged his first broadcasting role. Word got back to the BBC West Region HQ about John's commentaries and they offered him the chance to do match reports into Sport in the West, though he was billed at the time as John Baldwin for fear that his WDP bosses cottoned on to his moonlighting. The adopted surname came from the newspaper's office in Baldwin Street, Bristol. John was offered freelance work at the BBC West Region as a news reporter and presenter of The Week in the West. He joined the staff in the early 50s organising coverage across the region for BBC Television News as well as contributing news items for the Light Programme's Radio Newsreel. 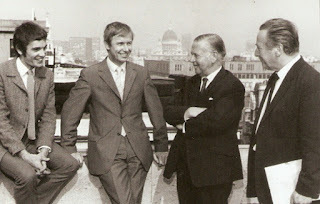 By 1956 John had made the move to London as a staff reporter based initially at Egton House. For the next decade he would shift between radio and TV work and between domestic and foreign reporting. His first overseas posting was as a UN correspondent in New York, later he reported from the Middle East, France, Algeria, Washington, India, Brussels and Vietnam, and even briefly worked out of Westminster; at one point being the BBC's Scottish Lobby correspondent. For a while he was back in the UK on the telly as one of the presenters of the south east region news round-up Town and Around working alongside Nan Winton and John Ellison. Occasionally he would read the main TV news bulletins including the midday ones "when Corbett Woodall had overslept and failed to make it in on time". Meanwhile when BBC2 started in 1964 he and Gerald Priestland would work a two-handed presentation on the nightly Newsroom. But TV didn't really suit him at the time: "radio seemed to offer many more opportunities to someone like me with ambitions to work abroad." 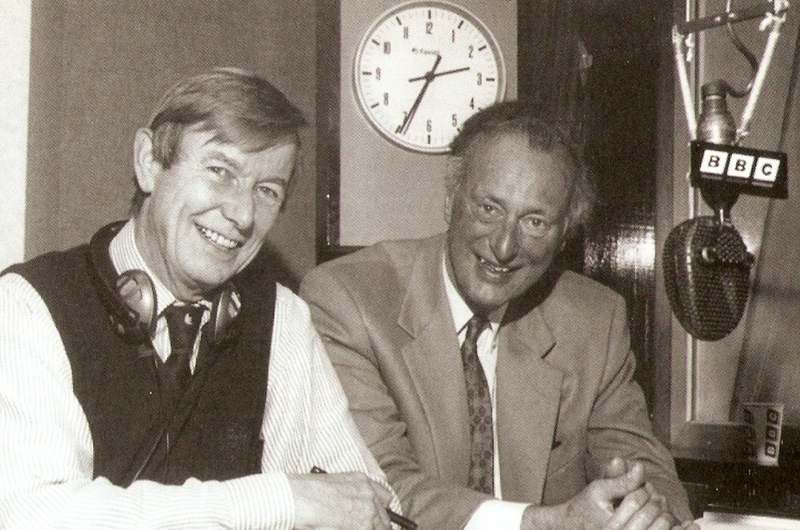 John Tidmarsh in the studio with Paul Eddington. In 1966 John was offered the chance to launch Outlook, on the proviso he did so as a freelance. Initially working the back end of the week he spent the rest of the week over in Brussels as a BBC news stringer, and continued to commute for the next two years. The initial format of Outlook was innovative for the time and John observed that "there were those who thought the programme format could not possibly work. Traditional thinking deplored the idea of having serious current affairs mixed up with magazine material and star guests". "Our guest that day was the film actor David Niven. He'd hardly been introduced when Colin was handed a news flash saying that Egypt's President Sadat had been assassinated. For the rest of the programme David Niven hardly said a word. But afterwards he was very understanding and charming about it. I think he was fascinated seeing the world's number one radio station responding instantly to a huge and dramatic international event: the Newsroom, the Arabic Service, correspondents all round the world, all feeding us reports. David Niven, in fact, came back to the studio to be a guest some months later". John didn't totally disappear from the domestic audience; he deputised for Jack de Manio on Today during 1968 and 1969, presented Newstime and World Quiz 69 both on Radio 2 and then Radio 4's evening News Desk (1974-6) as well as narrating a number of schools and further education programmes on both BBC radio and TV. In 1979 an old colleague from his days at Television News at Ally Pally, Colin Riach, asked him to present a BBC1 show he was now producing: Young Scientist of the Year. John presented the 1979, 1980 and 1981 series - look out for an edition on YouTube. John continued to preside over Outlook for nearly thirty-two years until the programme was, in BBC parlance, "refreshed" and he was moved aside, though he continued with a series of major interviews for the next year or so. He left the BBC in 1998, ironically just a year after having received the OBE for service for broadcasting. Reflecting on his time with the World Service John remembered the words of a listener he'd met in the Prague, a Mrs Dachnikova, who'd experienced at first hand the 'Velvet Revolution' of 1989: "I just wanted to thank the BBC for all you did for us over the past forty years. We could not believe anything we heard on our own radio or the television or read in our newspapers. You told us what was really going on in the world. You gave us hope that one day things would change." This is an extract from the edition of Outlook as heard on 1088kHz/276m on Friday 27 July 1974. 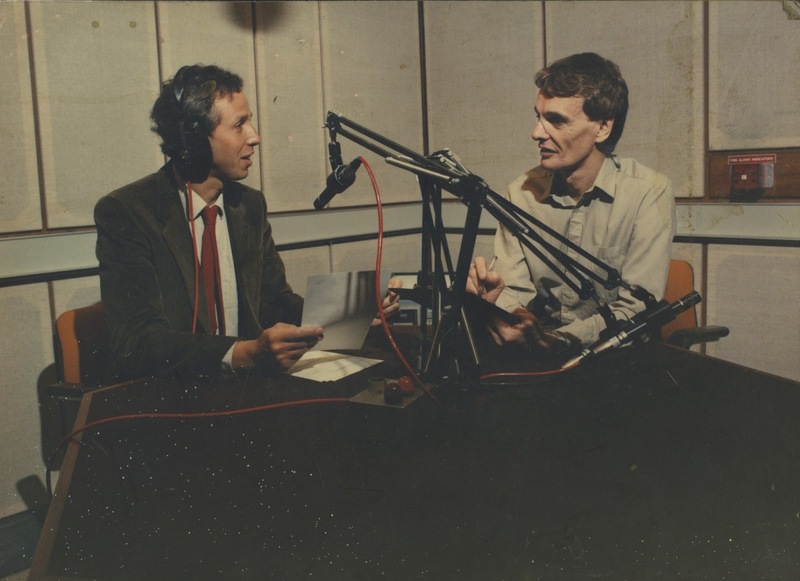 John Tidmarsh interviews journalist Colin Legum about South African sport and apartheid and then introduces Steve Race with his Musical Atlas A to Z.
Colin was a regular presenter on Outlook for 21 years. He'd spent his formative years in Africa, having moved there at an early age when his father, a BBC engineer, emigrated to Rhodesia. As a schoolboy in Salisbury he appeared in various productions, wrote weekly columns for The Livingstone Mail and Central African Post and, on leaving school, joined the Northern News in Lusaka. His first radio appearance had been back in London during the war when he'd been in a Criterion Theatre stage show along with a number of older children, including Petula Clark, who sent messages to British troops. However, his first proper radio job was as an announcer with the South African Broadcasting Corporation before moving on to the Tanganyika Broadcasting Service as Swahili Programme Organiser - he'd learnt the language after six weeks day and night study on a mission station. Moving to Kenya Colin became Senior Producer, African Services, Voice of Kenya and Acting Programme Organiser, English Service before returning to Britain to take up a television production course with the BBC. 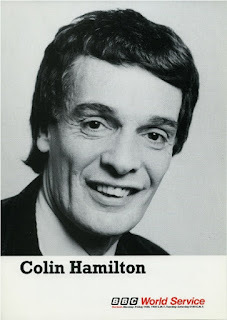 It was at that point, 1963, he was given the opportunity to join the roster of presenters on the Light Programme's daily magazine show Roundabout; he remained with the programme until 1968. At the same time as Roundabout he was also putting in regular stints on Radio Luxembourg. 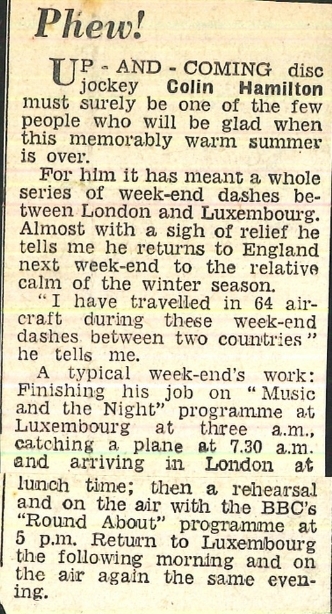 The Evening News and Star of 28 September 1964 (left) records Colin as making a "whole series of weekend dashes between London and Luxembourg". 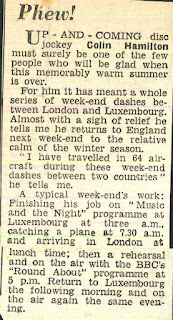 A typical weekend's work was: "Finishing his job on Music and the Night programme at Luxembourg at three a.m., catching a plane at 7.30 a.m. and arriving in London at lunch time; then a rehearsal with the BBC's Roundabout programme at 5 p.m. Return to Luxembourg the following morning and on the air again the same evening." 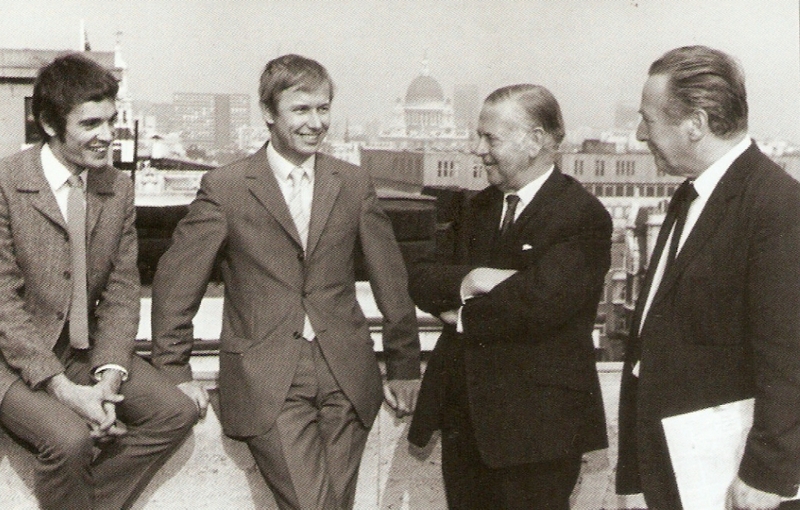 In 1966 Colin joined the launch team at Bush House for Outlook, initially looking after the Wednesday editions. He stayed with the programme for 21 years, a run only broken by a six-month spell in the early 80s with WKAT in Miami. For the World Service he also presented Exploring London, Pop Goes the Music, Records Round the World and Rhyme and Reason. 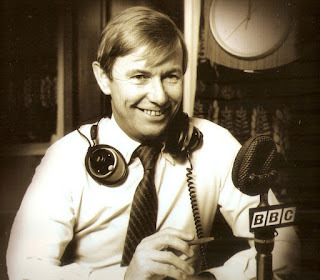 Over on the Home Service, and then Radio 4, he presented the regional news bulletins for the South-East (1967-69). He also worked for the BFBS, and continued to do so when he left the BBC, on the music shows Top Twenty and Weekend for Two and later as a newsreader. It was in 2007 that he left London to emigrate to Mexico. Long having an interest in writing and travel he would join, and then chair, the Puerto Vallarta Writers Group. Last August friends and family became concerned about Colin's whereabouts. It transpired that he'd been brutally murdered by two assailants during a river trip. His body was dumped and then his apartment ransacked but, alerted by security, the police caught them red-handed. It was a tragic and shocking end. You can hear the 40th anniversary edition of Outlook online here. With thanks to Ian Hamilton and Richard Tucker. 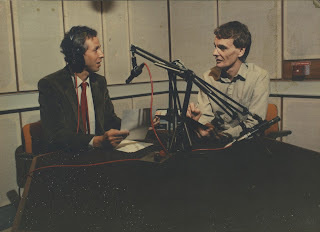 I was a great fan of John Tidmarsh on the World Service during the 80s and 90s. Outlook was never quite the same after he was replaced. Speaking of which, whatever happened to his successor Frederick Dove? Have you ever done a post or two on the old BBC World Service programs 24 Hours and The World Today? It was always a thrill to hear those signature tunes, as they existed, in the late 70s and early 80s when I first discovered shortwave radio and used to listen late into the nights during weekends. Hi. Frederick Dove just describes himself as a freelance presenter but I've not found any radio stations he appears on. He left the BBC in 2008. I've not written specifically about 24 Hours and The World Today but if you look at the post I wrote about the World Service in February 2011 that includes some clips.